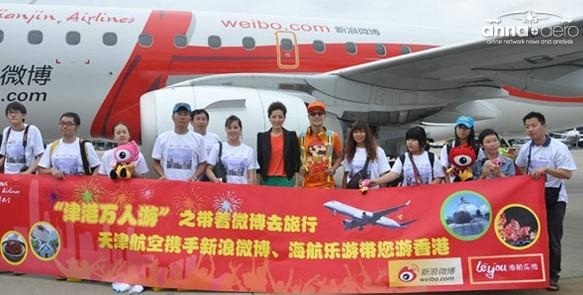 Tianjin Airlines’ aircraft branded with the website Weibo.com, a Chinese equivalent of Twitter, operated the first route to Hong Kong. Actress Zheng Li welcomed the five winners of the airline’s Weibo competition who all get to spend two days in HK for free. Tianjin Airlines, the regional sister carrier to Hainan Airlines, on 15 July launched a daily service from its Tianjin (TSN) base southeast of Bejing to Hong Kong (HKG). The 1,900-kilometre route is operated with E-190 aircraft, competing with Air China’s nine flights a week.